New Indiegogo Crowdfunding campaign offers coffee drinkers in Chicago a great deal! In honor of their new café in Oak Park, Illinois, Mojo Express is offering an amazing deal to their supporters. Exclusively at Mojo Express’ Indiegogo Campaign, visitors have the opportunity to get unlimited gourmet coffee for the rest of the year, over $500 in value, for only $150. For that low price, supporters get a custom Mojo Express travel mug with unlimited coffee and tea refills through 2014, redeemable at any Mojo Express location. “I want to give my customers an awesome deal as a way of saying thanks for loving my mobile coffee bus,” Mojo Express owner Renee Estese-Long commented. The unlimited coffee is just one of several great specials coffee lovers can indulge in. This offer is only available through the company’s Indiegogo campaign. With the funds raised, Estese-Long will renovate the retail space on Lake Street and turn it into a café the community will love. By offering fantastic promotions all her customers can enjoy, Estese-Long is changing the way people think about Crowdfunding and her coffee. Her goal is to take her popular mobile coffee bus and turn it into a comfortable space the community will come to know and love. 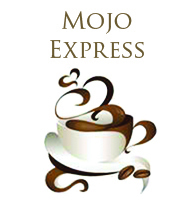 Mojo Express is more than your average coffee shop, serving organic and fair-trade coffees along with delicious sweet potato pies, homemade baked goods and delectable pancakes through a partnership with the other popular Chicago food truck, Babycakes. The company supports small farmers, sustainable coffee, as well as the Lupus community. For $350, supporters get a limited edition Mojo Express Travel Mug with unlimited coffee for the rest of the year and all of 2014. For $450, supporters get the mug and unlimited coffee described above AND a freshly-baked pie every month for a year. For $5,000, Mojo Express will personally deliver coffee to the supporter and his or her office for an entire year.